Players at Kaboo.com will experience a constantly evolving casino adventure, and missions that unfold as new chapters from “The Book of Kaboo” are released. Each chapter will tell an alternate story of a selected casino game and challenge the player to complete missions. With an infinite amount of levels there will always be a mission to be completed and by doing so; earning Echoes that can be exchanged for wagering free Free Spins. WILL I GET FREE SPINS AND WHAT ARE ECHOES? Kaboo.com have a secondary currency that are called Echoes. Echoes can be exchanged for Free Spins. 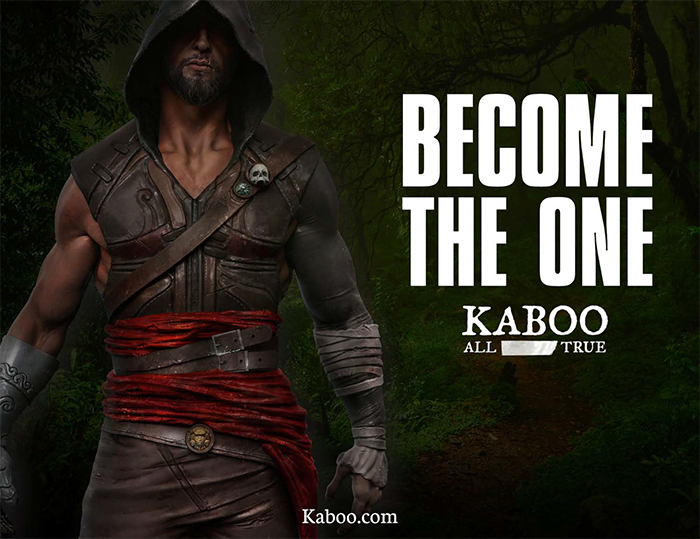 Compared to most other casinos, where you get an amount of Free Spins locked down to Starburst or other games with low spin values, Kaboo.com allows you to decide how you want to spend your Echoes. Exchanging 100 Echoes for 100 Spins on Starburst at 10 cent spin value or 10 Super Spins on Dracula at €1 spin value. There are plenty of games with different spin values to choose from. And winnings from these Spins are all without wagering requirements, so it’s cash in your pocket! 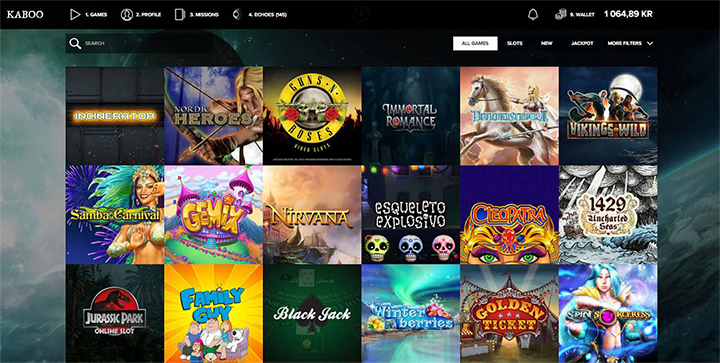 Kaboo.com provides slots from a long list of game suppliers including: NetEnt, Microgaming, Quickspin, Betsoft, Yggdrasil, IGT, Ash Gaming, Blueprint, Playtech, Nextgen, Elk Studios, NYX, Thunderkick, Rabcat, Quickfire, and PlaynGo. In total over 600 games are being offered from the world's leading game developers! All games are available to play online without having to download any software. Kaboo.com is mobile-first, built from scratch using the latest technologies. It’s not only mobile first, it’s also fully responsive with a smooth transition between any device used such as mobile, tablet or desktop. With over 200+ games in the mobile portfolio it’s sure to be a great experience! Players at Kaboo.com have plenty to enjoy when it comes to table games. Over 20 different variations of blackjack (including Double Exposure BlackJack), 12 variants of roulette (including French Roulette), and 7 variants of baccarat (including Baccarat Gold). Other games include Pai Gow Poker, Red Dog Progressive, TXS Hold’em, Vegas Craps, and Poker Pursuit. With player experience as Kaboo.com’s stated top priority, we can assure you that you will be happy. With an infinite amount of levels in missions there will always be a mission to be completed and Free Spins to be earned. As a Kaboo customer you can expect to be rewarded properly and in correlation with your gaming pattern. Kaboo.com aim to have the friendliest and most experienced customer support as well as fast payments solutions. Kaboo is aware of how essential it is for customers to receive a warm welcome, and nothing says welcome better than making sure your winnings are in your pockets extremely fast. It is as safe to play at Kaboo.com as it can possibly get. The site is equipped with the latest in digital encryption technology, so your data is in good hands! Customer service is top notch. Whenever a player has a question, they can count on a Kaboo representative to be available 7 days a week, through a convenient live chat interface. Live chat can even be used to attach relevant documents or pictures about an issue, something that not many casinos offer. Customer service is available all week between 10:00 – 24:00 CET via chat, phone and email. The customer service team can give you guidance in English, Swedish, Finnish and Norwegian.